Click here to take a look, and see the full range of services we can offer for your motorbike. 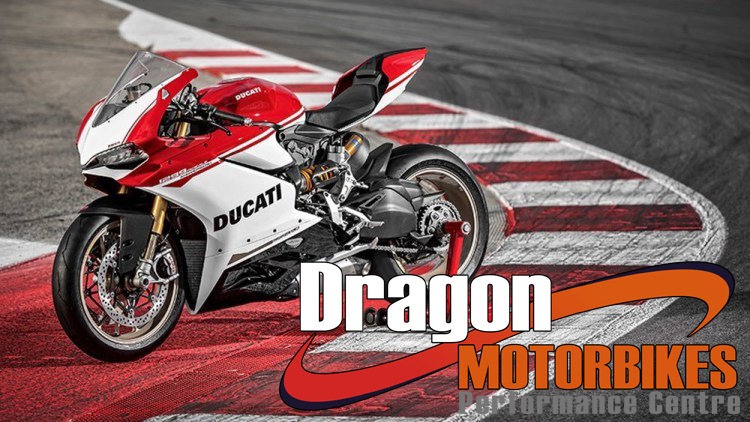 Dragon Motorbikes was created in 2015 with the initial idea of putting our dynos into a different unit offering us more space. This quickly morphed into Dragon Motorbikes as many of our customer at Turbopacs have bikes and visa versa and demand for bike products and services increased. It made sense to start providing a comprehensive package of products and services for the motorbike scene and so Dragon Motorbikes was born. We now have a great team working at Dragon with close support from the guys at Turbopacs….theres a real passion on a day to day basis, with a genuine desire to be the best we can and provide a quality service to our customers. Dragon Motorbikes is a little different to what seems to be the norm…we don’t have just one Fuch bike dyno but 2 ! along with a 2 wheel drive car dyno with our Bike Dyno being very popular with our weekly FREE biker’s mornings…on most Saturday mornings between 9-12. Yes you heard right FREE at Dragon …only on saturday mornings…for bikers…Dyno power runs…great fun fantastic atmosphere. Bikers have cars and many cars drivers have bikes, so over the years we have been able to cater for both, the link with Turbopacs is natural and easy to cater for. Its this link that has lead to this project developing. Situated in Durham City right next to Tescos in Dragonville Industrial Park in a nice industrial unit. We have an engine and suspension room upstairs together with a comprehensive workshop which includes one of the Fuchs Dynos with wide band AFR data logging and also our 2 wheel drive car dyno…handy when tuning quads etc. Enthusiasm, enthusiasm, enthusiasm is what makes us tick. Coupled with in depth technical knowledge and high end equipment we are without doubt the regions most unique and comprehensive automotive specialists. The plan? The Reality ! 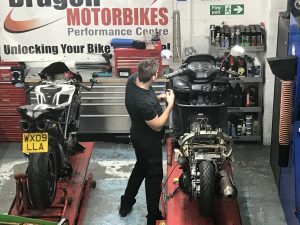 To create a dual focus motorbike tuning and repair centre for motorbikes and specialist car tuning, BUT allow us to jointly cater for specialist automotive tuning that appears to be very thin on the ground, such as 2 stroke tuning, repair, rebuild and tuning, carb installation and tuning on bikes as well as car applications ! 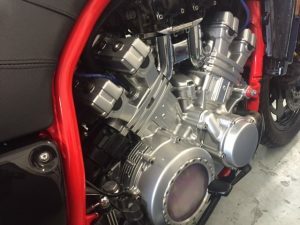 This will spill over into comprehensive engine preparation for cars and bikes, such as full engine re-builds, gas flowed heads, up-rated cam installation and even turbo/supercharger upgrades and allow both businesses the space and time to tune and test bikes and cars with less interruption and then see what nature has in store for us. Dragon Motorbikes is NOW open…so why not give us a call or pop in ?